My HP Business Inkjet 2300 printer is not printing the whole page and I don't know how to correct this? The base model in the HP Business Inkjet 2300 series, HP 2300 makes a good investment, offering good workgroup functionalities for small to medium office settings. The HP Business Inkjet 2300 can handle heavy workloads, thanks to its 10,000 per month duty cycle. It is an economical choice as it uses the same CMYK combination, but with separate cartridges for each colour. These tanks also provide high page yields, which is ideal for work environments with heavy print loads. This single function machine is also capable of networking, although it does lack the versatility of multifunction devices that also offer wireless operation. The HP Business Inkjet 2300 measures only 21.x16.3x11.4 inches, which isn't as bulky as earlier business inkjet models, but still can take up a good deal of desk space. It can handle as many as 400 sheets of print media, 250 in the input tray and 150 for the output tray. Both of which can be found at the front panel of the machine. 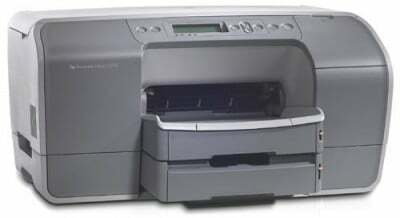 The HP Business Inkjet 2300 comes with Ethernet, USB and parallel ports for versatile connectivity options, and Mac and Windows computers are both compatible with the machine. The HP Business Inkjet 2300 scores high in terms of print quality offering 4800x1200 dpi maximum colour resolution, and up to 1200x1200 dpi for monochrome prints. Speed is also impressive, at 26 ppm for black and 24 ppm for colour outputs. Other advantages include network functionality, and a substantial monthly duty cycle. Built for heavy print loads, the HP Business Inkjet 2300 makes a good choice for businesses, although its lack of multifunctionality also leaves office users questioning its usefulness in the workplace, as many all-in-one printers dominate the scene.